I recently thought it's about time I review the books I have been reading since summertime. My previous book reviews can be found here. Lilo and Stitch: Collected Stories from the Film's Creators by Hiro Clark Wakabayashi. This book is beautiful and unlike most "art of" books. The stories that the creators write are personal and inspiring, but my favorite part is the artwork. Lilo and Stitch is one of my favorite movies based on the art and story. I love the delicate watercolor backgrounds and the early sketches made by Chris Sanders. This book has many sketches, watercolors, and other works of art from the movie that I had never seen before. There are even fun sketches that the story's creators made that are humorous. My only criticism is that the text from the stories sometimes cover up the beautiful imagery. Walt Disney Animation Studios The Archive Series: Design by Disney Editions. This is my favorite book from Disney's Archive Series because it has a little bit of everything- character designs, beautiful backgrounds, paintings, story boards, color studies and more. The book starts from the beginning of the Disney era up until the movie Tangled. I especially love the paintings by Mary Blair. The book is truly inspiring and I hope to make some master copies as studies. The Pixar Treasures by Tim Hauser. This book is an abbreviated version of The Pixar Touch: The Making of a Company by David A. Price, telling the history of Pixar. 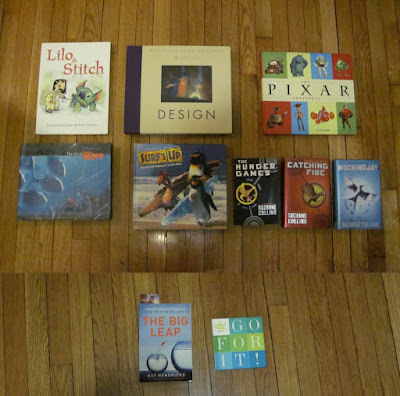 The Pixar Treasures is like a fun scrapbook. There is something fun and exciting to find on every page from postcards, to a flipbook, to letters, to pamphlets and more! I know alot about Pixar, but I still learned things from this book. This book is fun, exciting, and informative- everything a book should be! The Art of Finding Nemo by Mark Cotta Vaz. Finding Nemo is also one of my favorite movies because of the art style. I had been debating buying this book, but am really glad I did. There is so much beautiful art that I had never seen before. I especially love all the pastel pieces that were used to help decide color and lighting. The character designs are also particularly enjoyable to look at and see how each character progressed. It is nice to see that Pixar artists also work in traditional media such as oil paint, acrylic, and charcoal. A nice feature in this book is that they even give the medium and dimensions of each art piece. Surf's Up: The Art and Making of a True Story by Cody Maverick. Surf's Up is a great movie that is often overlooked. The art style and direction in this movie is inspiring. This book is incredible too (and can be bought relatively cheap). Like The Pixar Treasures this book has fun extra add on elements throughout the book including a DVD that talks about how they made the images, stickers, posters, postcards, and more! This book gives much insight into how computer animated films are made. The character designs and environments are beautiful. Another great thing about this book is the layout, it is fun and interesting, yet functional. I decided to read these books before the movie comes out in March. I had heard of The Hunger Games before but hadn't gotten around to reading them. The Hunger Games is about a girl named Katniss and how she overcomes numerous unavoidable trials put in front of her. Usually I am more of a fan of nonfiction, but the futuristic, semi sci-fi and fantastical world is very approachable. Suzanne Collins writes in such a way that the events and characters are relatable (even though they are very different). Almost every chapter ends in a cliffhanger, which makes an engaging story. I love the visual imagery in the book. I might even try to draw some of how I imagine the scenes or characters looking. I'm so excited for the movie to come out soon! I'm only a few chapters into this book, but I have found it interesting and intriguing already. This book is about how every person has one thing stopping them from becoming the best person that they can be. Usually this is because people have a zone in which they are familiar living within and reaching outside that zone becomes too uncomfortable. When people try to achieve something they eventually retreat back to what they are familiar with and do not reach their full potential. I need to read more about this book to learn about how people can overcome their obstacles and can reach their full potential. Go For It by Hallmark. This book is filled with tons of inspirational quotes about various things. The topics range include discovery, doing, success, and more. Most of the quotes I am familiar with, but some are new or ones I had forgotten. It is also nice to have a cute, little, well designed book that I can go to when I am needing a little bit of motivation or inspiration. 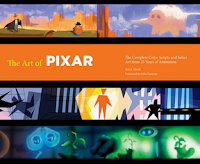 The Art of Pixar: 25th Anniv. : The Complete Color Scripts and Select Art from 25 Years of Animation by Amid Amidi. This book is amazing! Color scripts are Pixar's specific way of using color keys to help determine the color and lighting for their movies. Unlike color keys however, color scripts are long continuous horizontals which have the images and colors bleeding from one scene into another. This book has all the color scripts from all the Pixar movies to date (up through Cars 2). It even has color scripts from Pixar's shorts as well as production art from all the movies as well. This book is very helpful for me as an artist because I can study great color, layout, and compositions.